A poll shows Mitt Romney supporters are more likely to make environmentally friendly home improvements, such as installing solar panels. Republicans aren't generally thought to be the most environmentally-conscious voters. But a new poll shows Mitt Romney supporters are more likely to have made green home improvements than supporters of President Obama. Sixty-four percent of Romney supporters said they had made home improvements that could be considered "green" over the past five years, according to a survey released Monday by Harris Interactive and the solar power company Sunrun. Those improvements included things like buying energy efficient appliances and installing low-flow toilets. Only 58% of Obama supporters reported taking similar steps. "This data shows us that a new shade of green is emerging, and it's not dominated by any particular side of the political spectrum," Sunrun President Lynn Jurich said in a statement. 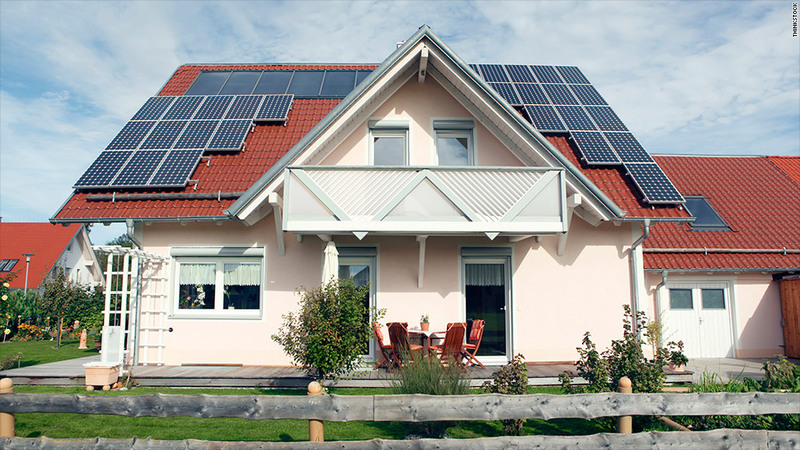 Romney supporters were also slightly more likely to have installed solar panels on their homes. Three percent of Romney supporters went solar recently, compared to only 2% of Obama supporters, according to the survey. A desire to save money appears to be the motivating factor for both sides though. Eighty-five percent of the respondents said lower energy costs was what motivated them to go green. Concern for the environment was actually the least mentioned factor. Only 33% of Romney supporters believe in global warming, according to the poll. But wealth is also a factor. Romney supporters tend to be older and more likely to both own a home and have the money to make green home improvements, said CNN pollster Keating Holland. "You don't make improvements to a place that you rent," said Holland. "Obama supporters, who are younger, are more likely to be renters." Obama supporters were more likely to have made green lifestyle choices, including buying organic foods and recycling, the Harris poll showed.